18 Comments As an Amazon Associate I earn from qualifying purchases. I saw this idea on Pinterest and knew immediately that it would be perfect. 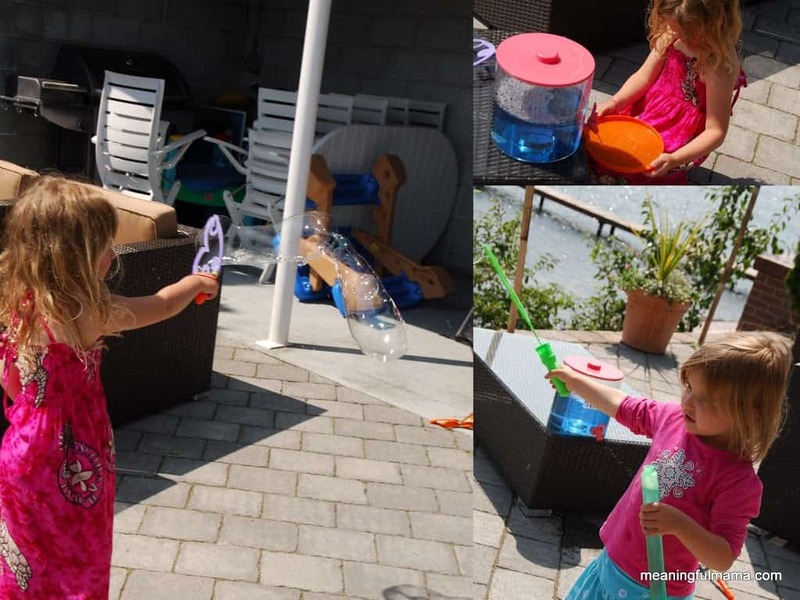 My children have the habit of having bubbles in their hands, and they reach over to pick something up or chase the bubbles, then they accidentally dump out all of the bubbles. Mix all ingredients together in a large container. 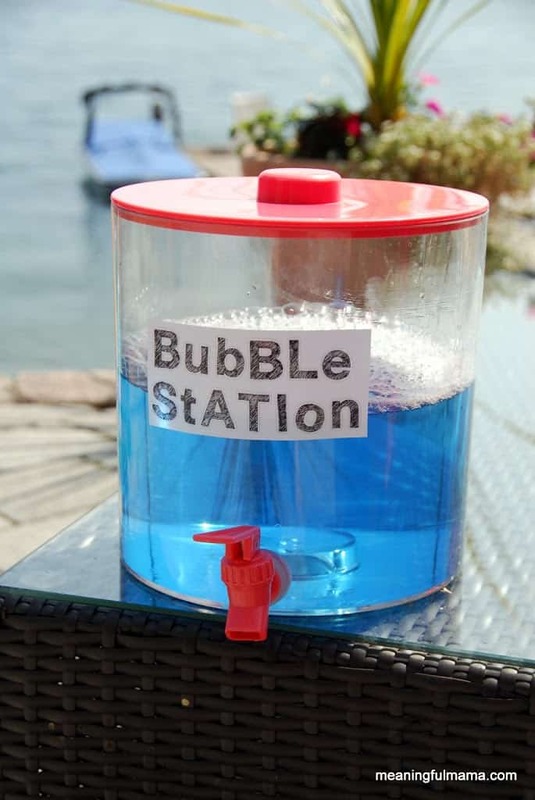 I did 10 times the recipe for our bubble refill station. It took a little bit of effort to hose off the patio because it just made more bubbles. So, I would recommend doing it over the lawn. That’s the only advice I have because I love having this refill station available to the kids. Who doesn’t love bubbles? Yes, who doesn’t love bubbles. I was wondering whether the corn syrup would attract ants…. It’s a really good question, and I can’t say for sure. I can tell you that we do have sugar ants that find their way to the patio when there is food around. I haven’t seen any around the couple of places we have kept the bubble station. However, after the kids were done, my husband just hosed down the area, so it might have prevented anything like that. Thanks for stopping by. That’s a good thought. Love this idea, pinning it! Thanks for the pin. I’m glad you liked the idea. Oh this post couldn’t have come at a better time!! Perfect timing for my daughter’s birthday party!!! Did you do it for your daughter’s party? I hope it was fun. You’re welcome. Thanks so much for stopping by! This is the best idea ever! 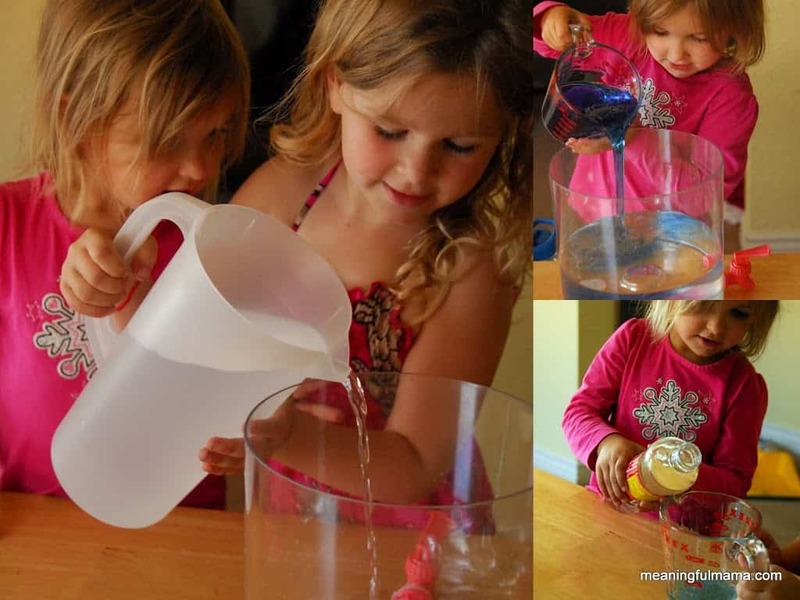 Thanks for sharing – I am so totally going to do this for my girls. They are constantly dumping out their bubbles. I’ve linked to this idea from my blog, Polka Dots and Lemonade, and I’m your newest follower – heading over from Sugar and Dots! Thanks so much so much for the bloggy love. I take it as a huge compliment that you linked back to me. Just checked out your site. Great work over there. Following you now too. What a GREAT idea! Very cool! Thanks. Just had a BBQ today, and the kids loved it. I love this idea. I think I have an old iced tea container that will work perfectly for my boys. Hmmm…I’ll have to try that. Yay…Your solution will not be sticky and not attract insects….the glycerice will help make longer lasting bubbles. What exactly is the corn syrup/ gelatin for?